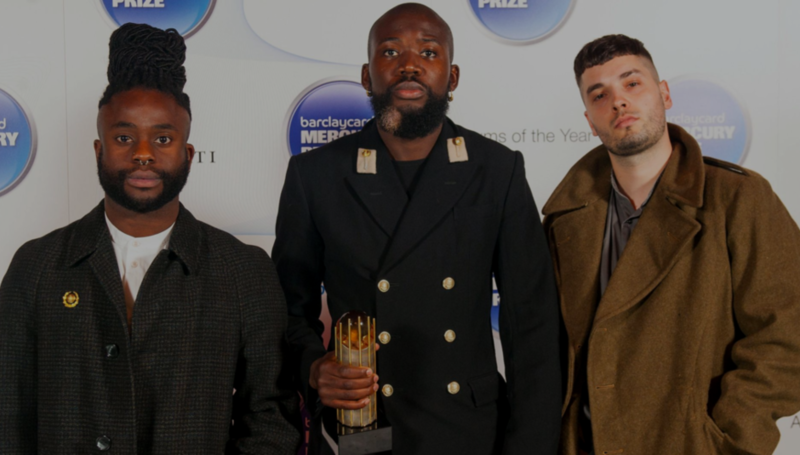 Last night, Young Fathers were crowned winners of the Mercury Prize 2014 for their triumphant debut album Dead. DiS' Editor, Sean Adams, and Singles columnist, Rob Leedham, both went to the ceremony. For all the moaning about a lack of Top of the Pops, and people banging on endlessly about there being 'absolutely no music on TV apart from Jools Holland and those rubbish pop channels on freeview...' 'because: Simon Cowell...' or 'because: YOUTUBE' there's now an awful lot of televised award ceremonies to broadcast music into unsuspecting homes. Whilst they're not all televised, there are reportedly now 38 music award ceremonies in the UK, and whilst this is good fodder for the Daily Mail and their Tory brethren to bash the BBC for starting The BBC Music Awards (the inaugral event takes place at Earls Court in December), these gong-giving-out-athons are merely a symptom of our baffling times. Much like the endless hours of live music from festivals (read: pop acts, dinosaurs and bands few have heard of, who haven't had a soundcheck, playing in a muddy field) that is presented without comment to provide context about about what you're watching to, y'know, enrich your experience, these televised awards ceremonies merely present the music in a take-it-or-leave-it fashion too. The problem is, despite the critical time and attention given to film and books and cookery and football, Music is deemed part of the 'entertainment' world. The entertainment paradigm doesn't work for musicians making music slightly more sophisticated than Calvin Harris' repetitive dance follies. The majority of the nominees tonight identify themselves as making something to be consumed a far deeper level. With the Mercury Prize acting as something more like the Turner or Booker prize, rewarding artistry, rather than sales, it seems baffling that it's TV show at all. So, if for some reason Young Fathers seemed like reluctant winners, that's because they don't make music to win awards. No one does, not really. The respect of their peers, maybe. To communicate with like minds, piss off an ex, to shove to fingers up to their parents or the establish, is all reasons to make music and art too. However, Young Fathers - like so many of the musicians we all love - make music because they have to: it lingers in their loins, the melodies loop around in their noggins until it burns through them and zaps out of them. They're not doing it for the fame and ever-dwindling-fortune. They're not attention-whores, they're musicians, who have communicated all that they want to say in songs, and won't achieve that in a reductive speech (Pre-emptive warning: "remember, you have sixteen seconds to make your speech") or quotes out of context in the tabloids (who - rumour has it - they requested didn't come to the press conference) (smart chaps!). Sitting at a table with more glasses and cutlery than any of the media bods I'm surrounded by knows what to do with - least of all the music critic from the Telegraph beside me who doesn't eat vegetables "because I don't" - tonight really was more like watching a disjointed TV show with 'Grimmy' spluttering off a few things between VTs. The lights kept coming on and going off again and cameras swooped overheard. Then there were the lengthy talking head segments where the likes of Gemma Cairney (she went to Mali, dontcha know??? ), paralympian Ade Adepitan and Sara Cox waffled on for what felt like infinity about the record they wish would win (at least I presume that's what they were talking about, it might as well have been voiceovers for biscuits or Boddingtons) on the big screens (which weren't used so that those of us tucked away in the corner could see the performances - but this isn't about me with beloved music expert Tim Lovejoy off the telly nattering away all night in my eyeline). These clips of people off of the radio and TV talking passionately about the nominees (or in the case of the ALL-CAPS ALL-THE-TIME ZANE LOWE "PASSIONATELY!!!!" in his speech about Royal Blood which made "rock music" in a manner that was more like a UKIP party political broadcast...) were meant to provide viewers with some sense of context and understanding about what they are about to see, but all they got were snippets of half-thoughts from everyone. Well, not everyone, Giles Peterson (surely a far better awards presenter candidate?? ), Jamie T and Jameela Jamil, did far more than spit a few sweet-nothings. Their short "VTs" to break up what was essentially 12 one-song live performances shone a light on the ideas and influences that weaved their way into the nominated record of their choose. And really, if the point of putting music into living rooms is to inform as well as entertain, they did their job. Televised music should reignite people's waning passion for music or begin fostering their deeper relationship with it. Stepping back from the room of clinking glasses and knowing glasses, all most music fans out there want from something the Mercury Prize TV Show is some musical guidance that's lacking in the media. These 12 albums are a guide post and distils what's happening in music now. Having never been to a proper 'press conference' before, I wasn't expecting the one at the Mercurys to be like the ones you see on telly. After a few minutes of cameras strobing in their faces, Young Fathers were asked a series of inane questions about whether this "changes everything" for them and how they will spend their £20k prize ("on a van so we can tour, probably"). I've never felt so dark inside as standing in a room full of "music journalists" glimpsing a dystopian future when these 'people' are all the music press has left. Once The Music Industry is rid of music fans turned critics who won't say that ABSOLUTELY EVERYTHING IS AMAZEBALLS, the media will be filled with these 'journalists' who've done no research and have no clue how to deal with musicians who are first and foremost 'artists' rather than attention-hungry publicity rent-a-gobshites, who act as mouthpieces for their 'personal brand'. The frustration at the band for not providing the hollow husks that were required of them, slowly turned to mild anger and open contempt. "They really don't make my job easy" remarked nearly everyone I spoke to in the press hub. Easy? You really want things easy? It was as if all anyone in the press room wanted was Jessie J to appear and save the day, because that would make their job "easy". These "journalists" understand your average red-carpet "professional". They know who and what a Jessie J or a Miley or a Bono is, and they don't even really need to ask a question to get their headline. These entertainers want the world to be enthralled by them, whereas Young Fathers aren't of that world, they're making statements in their music. Everything they need to communicate has been expressed in their record, and that is where your time and attention should be placed. This should be bleeding obvious, but as the media hovered for any extra nuggets from the band, but this wasn't what they were thinking. There was panic that they had "nothing to run" on the radio or in print. Sure, it would be easy for Young Fathers to put themselves in a box and give the scrum what they wanted and to play the game, but that would be a deceit not just to themselves but to readers, listeners and curious rubber-neckers everywhere. To lie and say "this means so much to us" or "this will change Scottish hip-hop" or whatever nonsense the press wanted to reduce tonight down to, without needing to think about it themselves, was shameful to witness. These soundbite hawks continued to gnaw away at the band for something headline-worthy until they were asked to stop. It ended, eventually. But not before someone asked "Who dressed you?" 1) DiS meets Young Fathers.